Party Animals! RG Avenue Bundle and LIVECAST Class! Hey there inky friends! 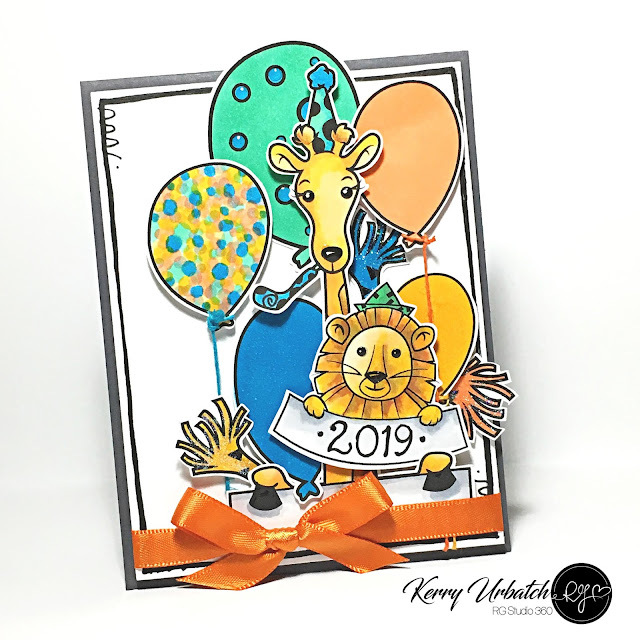 I'm popping in today to share a quick project with you that features some adorable images in the new RG Class kit: Party Animal! 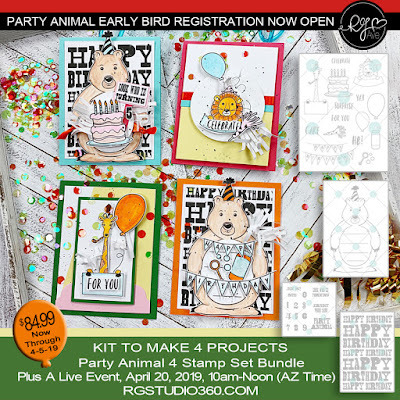 RG is hosting a virtual Party Animal card class on April 20 and you won't want to miss it!! You'll have the opportunity to join the livecast party when RG will walk you through making each of the four cards pictured below! Take advantage of the Early Bird Pricing by picking up your class kit at a discount by this Friday! The kit will return to regular pricing the following day. When you purchase the kit, you'll receive four complete stamp sets, four kitted/precut card projects and the digital files too! You'll also receive a secret url to have access to the live event broadcast on Youtube. If you can't watch live, it will be recorded so you can watch and make at your leisure! 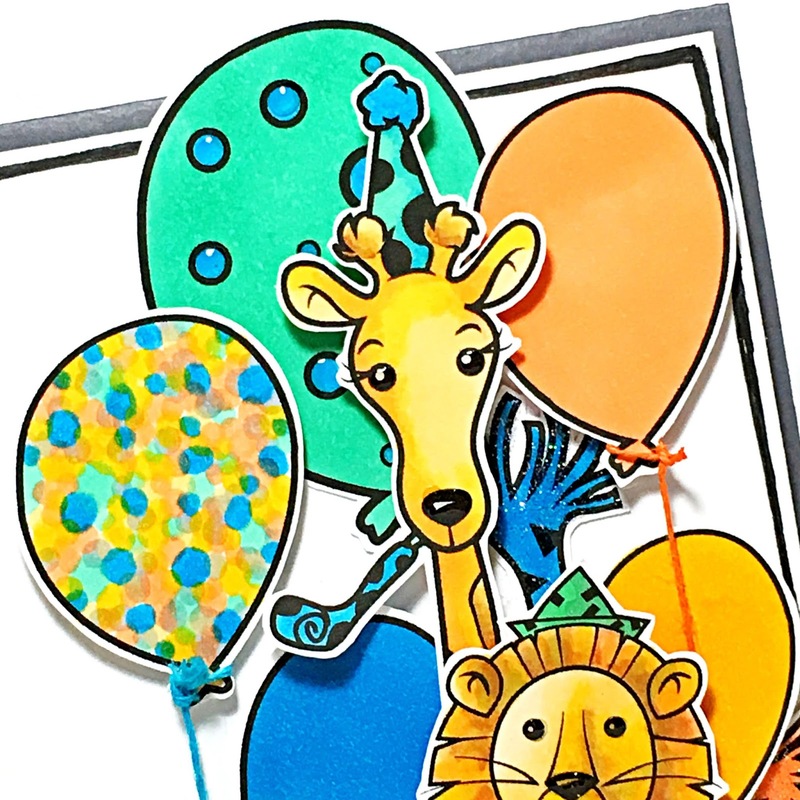 To create my card, I laid out the balloon, giraffe, lion and party horn images onto a MS word document (I stretched the giraffe image so he would be really tall and resized the balloon images and placed some of the circles from the bubble image onto one of the balloons), then printed the images on my home printer. After that, I colored the images with Copic markers. I've included a photo image of the colors I used at the bottom of this post. After coloring, I fiddled around with my layout (and tried different backdrop colors and finally settled on the white background with a doodly border. I think the white background really makes the images POP! Once satisfied with the overall composition, I popped everything onto the panel and then tied some coordinating Hemptique twine onto some of the balloons. To finish off the card, I tied an orange ribbon along the base of the panel before mounting it onto a piece of Gray Stuff Sugar Stock. I also used my black pen to write the year on the lion's banner. Thanks so much for hopping over to check out my card. I know you would enjoy the kit too! RG's classes are fun and engaging and you'll have a ball creating with him LIVE! 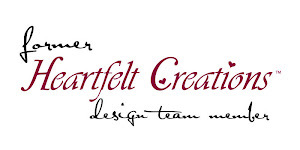 I'm joining my fellow Joy Clair design teamies as we celebrate one of our favorite stamp lines: Color By Faith! The Color By Faith line is a collection of stamps perfectly suited for stampers who desire to share their faith with others. It's also a line that features scripture, faith based sentiments and coordinating images to help you spread love, hope and comfort. If you've arrived here from Monica's blog, you're on the right track. If not, scroll down to the bottom of my post and you can start hopping right away! 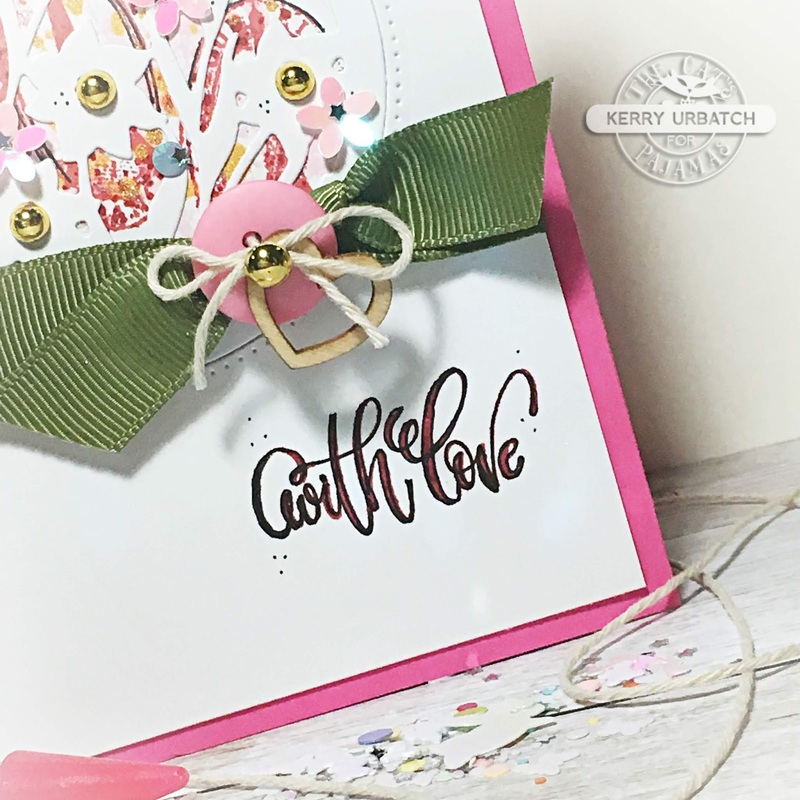 Not only is the Color By Faith line perfect for Faith journaling, the stamps work beautifully for cardmakers and scrapbookers. They even work well for your everyday creations or specialty projects. Today I created a special project for Easter gift giving. I was inspired to create a cute little dress featuring one of the newest sets in the Bible Journaling Color By Faith set called "Blossom". 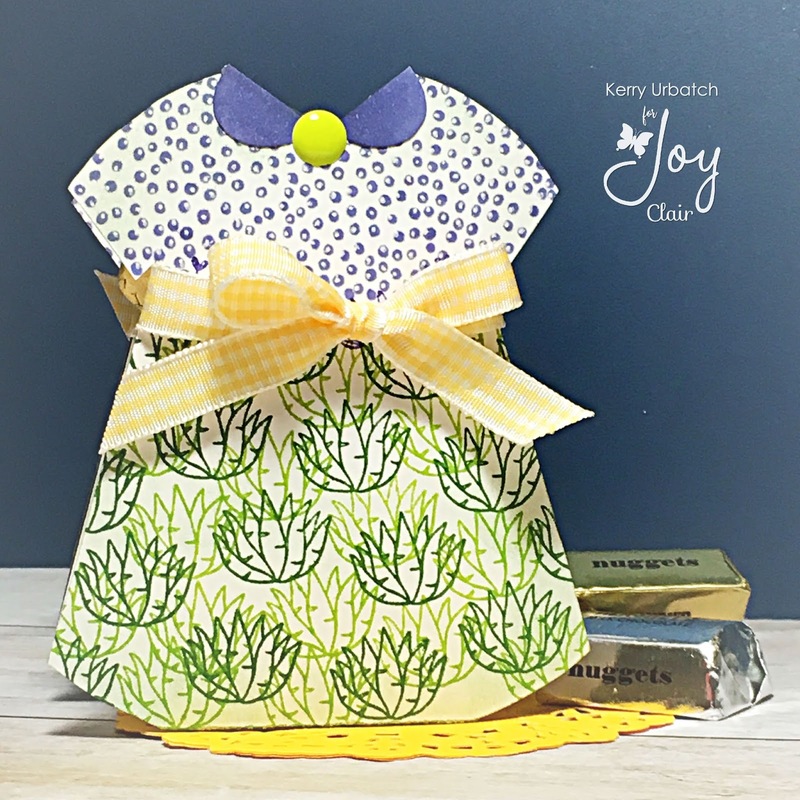 I wanted to create a cute little Dress treat Box from The Cutting Cafe. To create this project, I printed the dress template onto white cardstock using the PDF version of the files (they are available in SVG format as well) and then cut out the template. I then stamped the little agave cactus plant onto the bottom of the dress (both sides) using two different green inks. After stamping the cactus plants, I used a Copic marker and an Opaque White Gelly Roll Pen to create polka dots on the top portion of the card. Next, I added some yellow ribbon. Once the dress was stamped, I assembled the box by following the score lines. I filled it up with chocolate and now it's ready for gift giving!!! Thanks for hopping over! I hope you were inspired by my creation and I hope you enjoy the rest of the hop! 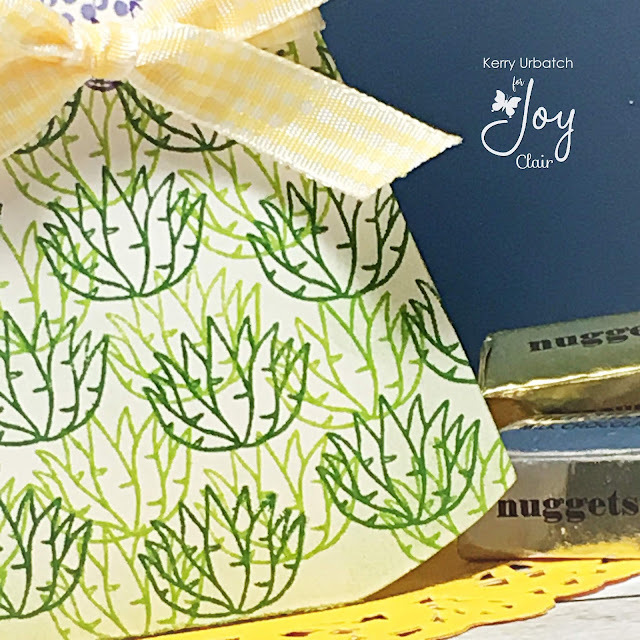 Remember, to celebrate the Color by Faith Blog Hop, Joy Clair Stamps is giving away a $25 Gift Card to One lucky winner! The winner will be chosen at random from the comments left on participating blogs, so make sure to visit each stop and leave a comment. 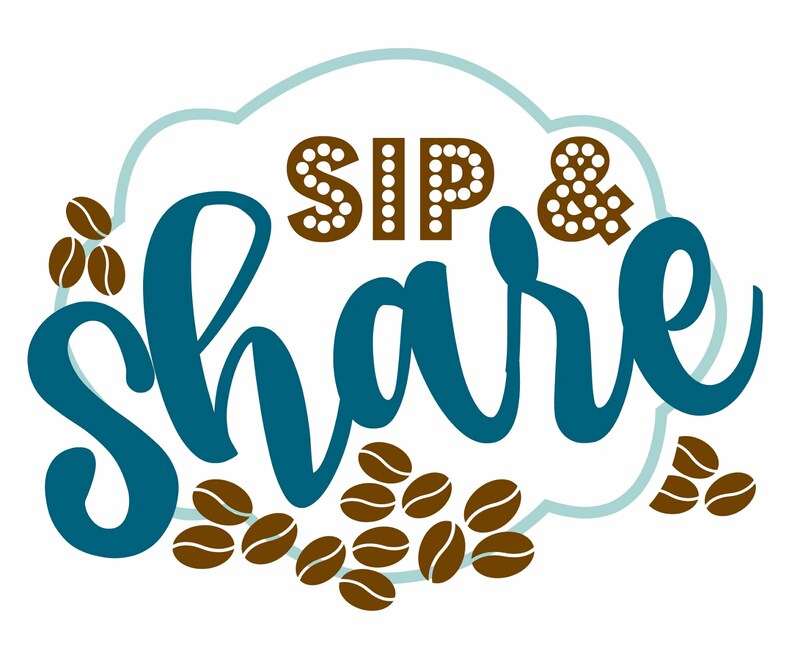 Leave comments by 11:59 pm ET 04-05-2019 on all participating blogs. The winner will be announced on the Joy Clair Blog on April 30, 2019! 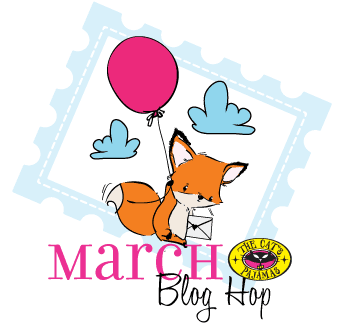 Please hop on over to Donna's blog for more inspiration! To create my first card, I stamped the Eiffel Tower stamp from the Travel Stickers set onto a piece of white cardstock over and over again with pink and then with wine colored ink. I then splattered with gold ink and some metallic silver ink. Next, I diecut the Spring Flower Duo die onto a piece of white cardstock so that I could overlay it over the stamped images. After it was overlayed, I attached some ribbon and golden pearls, added a pink button and a little veneer heart. To finish off this card, I added some sequins here and there using the new Spring Mix sequins. I love the little sequin grabber! It makes picking up and gluing itty bitty sequins so easy! As you can see below, I also added a bit of black linework around the sentiment and some random dots on the floral portion of the diecut. My next card features one of the dies from the Four Seasons die set as well as the Chichen Itza Mexico stamp from the Travel Stickers Set. I stamped the travel sticker with opaque white ink so that it could become a bit of my background. Splattering some of the white ink onto the panel helped add some texture too. 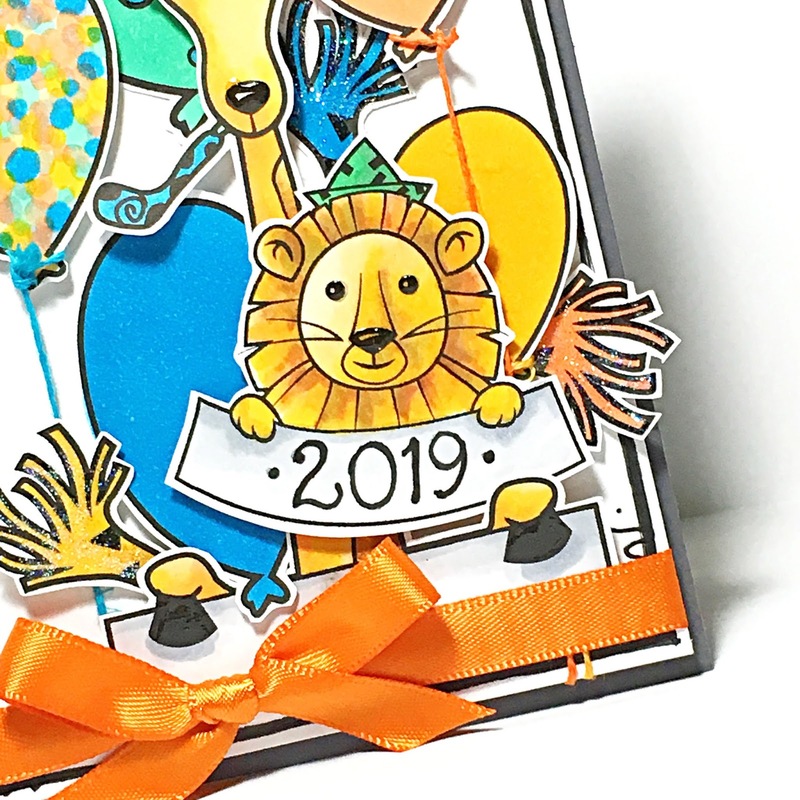 To add layers to my card, I diecut the stitched squares and more and cut them out to allow for a fun framed element that I could use on my card. After diecutting and assembling the cruise ship image, I mounted it onto my card panel and added some of the green Holo sequins. I think these sequins have a beautiful aqua-like green hint in the colors and it reminded me of my trip to Mexico several years back. A closer peek at my card panel shows the pyramid image on the stamp set. Thanks for hopping over. 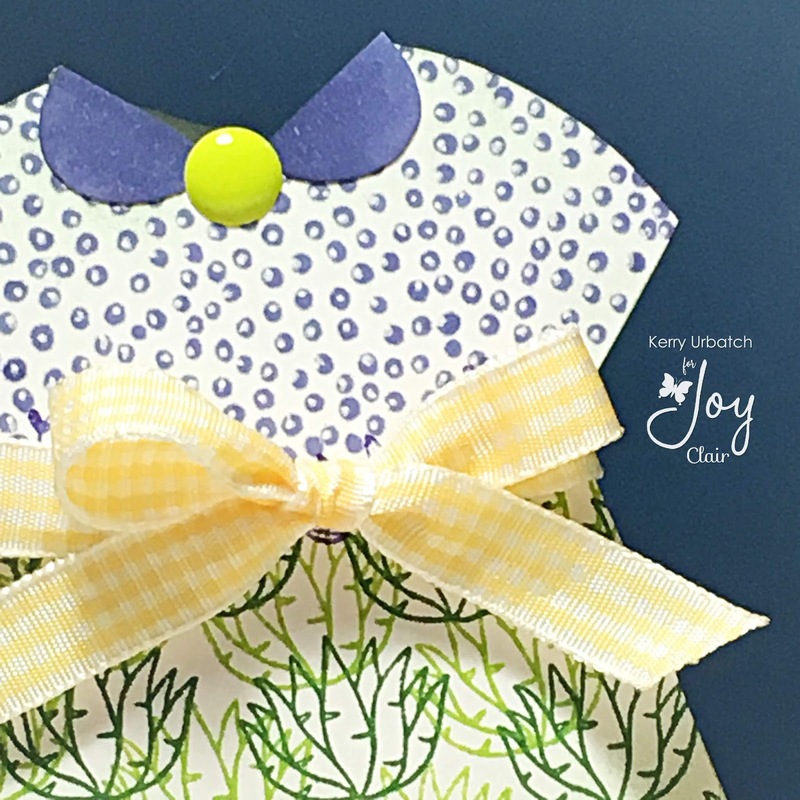 Now it's time to hop on over to Wendy's blog to check out her creations! See you soon!